Start with three bath-size towels. From one of the towels cut: two 3″-wide strips (lengthwise) for the ruffles, two squares for washcloths, and a rectangle for a hand towel. With a serger, roll hem all the raw edges. 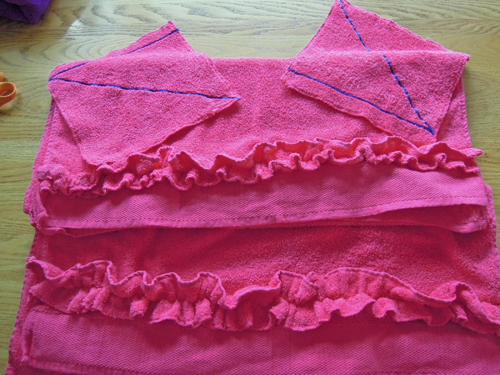 The towels are very bulky, so I used dental floss and basted it along the center of each ruffle with a zigzag stitch. Clear Embroidery Foot #39 and Embroidery Foot #6 both have a small hole in the bar between the toes; insert the dental floss through this guide and it will automatically be placed in the center of your zigzag stitches. Pull the dental floss to ruffle the strips of toweling, then use a zigzag stitch to stitch one ruffle to each bath towel. Next Next post: Introducing Sewing Celebrity Mimi Goodwin!